According to a new market report on the Internet of Things (IoT) in logistics market published by Transparency Market Research, the global Internet of Things (IoT) in logistics market is projected to reach US$ 63,728.6 Mn by 2026 driven by exponential rise in IoT applications in logistics. 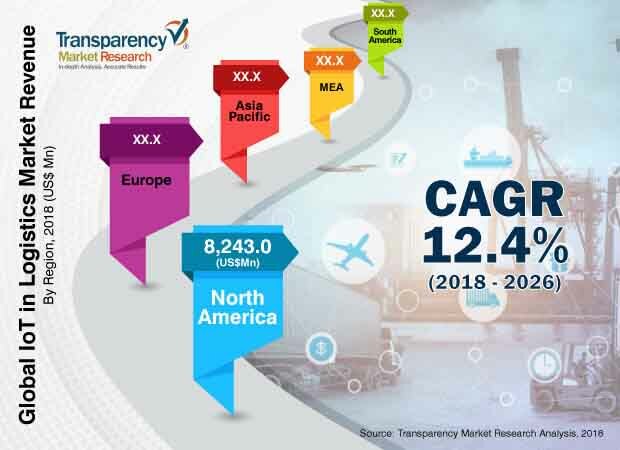 The market is projected to expand at a CAGR of 12.4% during the forecast period from 2018 to 2026. Growth of the market is attributed to rise in demand for IoT in logistics and increase in adoption of cloud-based deployment models to offer quality service to customers. North America is anticipated to lead the global Internet of Things (IoT) in logistics market, followed by Asia Pacific, Europe, Middle East & Africa, and South America, during the forecast period. The IoT in logistics market is in a nascent stage and is anticipated to expand rapidly in the next few years. Obsolete systems and labor-intensive processes create more challenges and complexities, slowing the operations and hindering the ability of industries to increase revenue. These manual tasks can result in significant inefficiencies and productivity losses for businesses. The transport management system which includes vehicle management, driver management, and operations management is globally expected to rise at a CAGR of 10.1% over the forecast period. This shows that the logistics industry is trying to form a complete digital, flexible, and connected supply chain optimized for e-commerce and last-mile, last-minute delivery. With the deployment of advanced technology, digitalization has witnessed increased adoption across the transportation and logistics industry. Germany-based logistics company Kuehne + Nagel deployed a logistics control tower to make the most of cost competences, while abiding to time constraints and observing standards in security and documentation. The tower uses transportation management software and order management software to exchange data amongst carriers, service providers, and senders & receivers of goods. Based on solutions, the global IoT in logistics market has been segmented in terms of software, hardware, organization size, application, and region. The hardware segment dominated the global market in 2017. Hardware enables users to optimize their applications on branded, reliable, and customized hardware. In terms of organization size, large sized organizations held a prominent market share in 2017 and are expected to continue to dominate the market during the forecast period. North America led the global IoT in logistics market, accounting for considerable share in 2017.The U.S. is the major market for logistics solutions in the region. IoT based logistics solutions are also becoming popular in Canada and Rest of North America. The IoT in logistics market in Europe, Asia Pacific, Middle East & Africa, and South America is expected to expand at a rapid pace during the forecast period. The research study includes profiles of leading companies operating in the global IoT in logistics market. Key players profiled in the report include Cisco Systems Inc., Octonion SA, Kaa IoT Technologies, LLC., NEC Corporation, Honeywell International, Novire Technologies, SAP SE, Intel Corporation, Oracle Corporation, Bosch Software Innovations GmbH, Rockwell Automation, Inc., BICS SA/NV, Amazon Web Services, International Business Machine (IBM) Corporation, and PTC Inc.